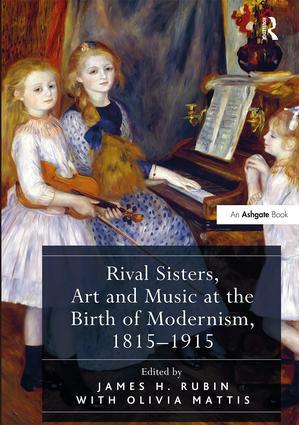 Introducing the concept of music and painting as 'rival sisters' during the nineteenth century, this interdisciplinary collection explores the productive exchange-from rivalry to inspiration to collaboration-between the two media in the age of Romanticism and Modernism. The volume traces the relationship between art and music, from the opposing claims for superiority of the early nineteenth century, to the emergence of the concept of synesthesia around 1900. This collection puts forward a more complex history of the relationship between art and music than has been described in earlier works, including an intermixing of models and distinctions between approaches to them. Individual essays from art history, musicology, and literature examine the growing influence of art upon music, and vice versa, in the works of Berlioz, Courbet, Manet, Fantin-Latour, Rodin, Debussy, and the Pre-Raphaelites, among other artists. Contents: Musical paintings and colorful sounds: the imagery and rhetoric of musicality in the Romantic Age, James H. Rubin and Olivia Mattis. Part I Origins: Opsis Melos Lexis: before and around the total work of art, Simon Shaw-Miller; Caspar David Friedrich and music: a ’divine kingdom of hearing’?, Julie Ramos. Part II Dialogues: Berlioz, Delacroix, and La Mort d’Ophélie, Peter Bloom; Music as magic architecture: immersive environments in Baudelaire and Whistler, Suzanne M. Singletary. Part III Realism and Music: Gustave Courbet and music: soundscapes and the total work of art, James H. Rubin; Music as muse: Thomas Eakins's realist agenda in Elizabeth at the Piano, Debra Hanson; ’One art eating the other’ in Ã‰mile Zola’s L’Oeuvre, Michelle Foa. Part IV Musicality in Paint: Manet, Liszt and The Old Musician, Campbell Ewing; Strums the word: Manet’s Spanish Singer, Therese Dolan; The musical imagination of Henri Fantin-Latour, Anne Leonard. Part V Grand Schemes and Other Bases: Schwind’s ’Symphony’: Beethoven, Biedermeier, and the cruelty of romance, Cordula Grewe; Burne-Jones’s Le Chant d’amour and the condition of music, Tim Barringer. Part VI Fin de Siècle: Rodin’s Beethoven, Olivia Mattis; Grafting a dream: Henri Bergson, Claude Debussy and Henri Matisse, Charlotte de Mille. Art/Music, Music/Art - a bibliography, Olivia mattis; Index. James H. Rubin is Professor of Art History and former department chair at Stony Brook University, New York. He is the author of 12 books and over 60 articles focused on nineteenth-century art. Olivia Mattis is a musicologist and co-author of the exhibition catalogue Visual Music. She has curated numerous music-art exhibitions and is a recipient of an NEH Fellowship and an ASCAP-Deems Taylor Award.